Material and sources to help new lab members get up to speed, or remind current members how to do things we haven’t done recently. The Yoder Lab Github page, github.com/jbyoderlab, is our central point for project creation, management, and sharing; to start a new project, download or fork our project template. The Yoder Lab Slack channel, yoderlab.slack.com, is the place for coordination and communication among lab members. E-mail Jeremy for access. The Nobel Institute’s Medicago handbook includes protocols for growing, storing, and experimenting on Medicago truncatula, background on its natural history and the large body of research into its evolution and ecology, and descriptions of some community resources. Poorter et al. (2012), “The art of growing plants for experimental purposes: a practical guide for the plant biologist” is a nice review of considerations in designing and managing greenhouse and growth chamber experiments. The Medicago Hapmap Project is the clearinghouse for current and past Medicago truncatula genome assemblies and genome-wide sequence and structural variation. The Joshua Tree Genome Project has an annotated bibliography of research into the evolution of Joshua tree, its interaction with yucca moths, and its projected future under climate change. CSUN Biology’s comprehensive list of intramural funding opportunities gives you a lot of small grants and scholarships to try for, for both graduate and undergraduate students. Open Grants compiles publicly-available examples of grant proposals to a variety of funders, including many appropriate to the lab’s research. Before starting a new proposal, take a look there to get a feel for formatting and the kinds of ideas that succeed with the funding source. For photos of our study species, check out Jeremy’s Flickr page: here’s Yucca brevifolia and here’s Medicago truncatula. 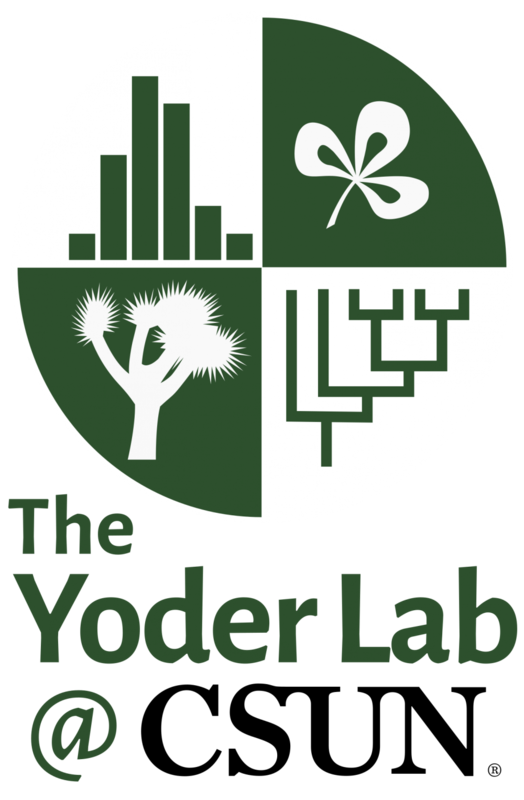 The Yoder Lab website uses Google Fonts typefaces Lora and Alegreya Sans.